An inspiring theatrical concert evening to lift our resistance and future lovin’ souls. Let’s get together as a state, a region. Jefferson Theater, Downtown Mall, Charlottesville, VA.
Who Will Sing for Me? Virginia Greene will. Virginia Greene is serving the SUN SiNG collective as wildlife painter, and consultant. 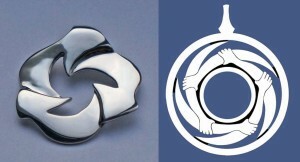 She designed the SUN SiNG logo and shirts. Each member of the SUN SiNG collective has chosen to sing for a particular pipeline endangered creature and a series of ARTivist portraits is being released now as “Who Will Sing for Me?” See them all here. Another exciting guest ARTivist for the SUN SiNG Concert: April 26 will be 1000 Flags 1000 Waters with Mara Eve Robbins. You can join her outside the theater starting at 4 pm and make a flag of your own. We promise an immediate chance to dance em and wave em high. SUN SiNG doors open at 5. Concert begins promptly at 6. This entry was posted in Events, Songs and Stories on April 19, 2019 by Ellen Bouton. Show up – bear witness! Come to the Buckingham Planning COmmission meeting on Monday April 22, 2019 (Buckingham County Administrative Building, 13380 West James Anderson Hwy (Rt. 60), Buckingham). 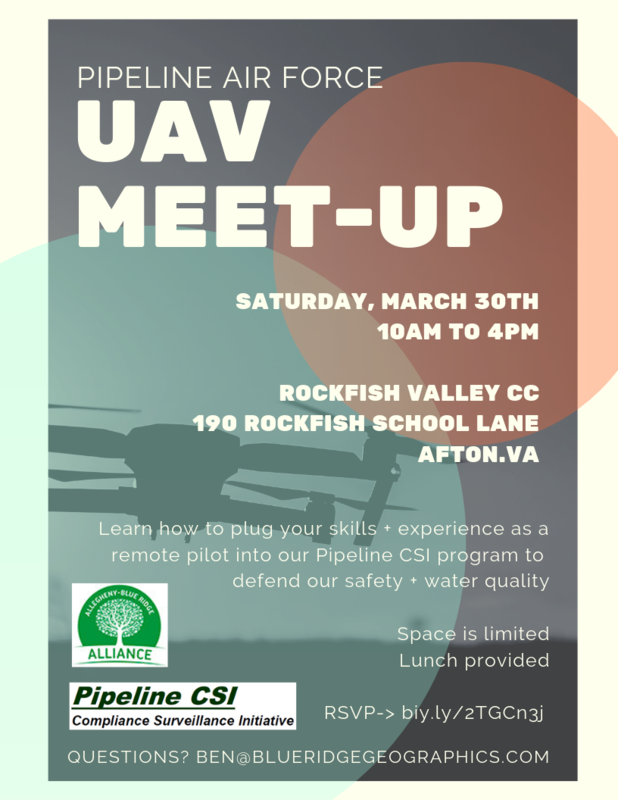 Ask the Supervisors to amend the Special Use Permit (SUP) for the compressor station’s emergency communication tower to require that the infrastructure be served by broadband and that a last mile provider of broadband be found for businesses and residents along the pipeline. This will enhance safety and economic self-sufficiency in Buckingham, and especially help those who are forced to accept the pipeline. Broadband continues to be the best available technology and at the Virginia Chamber of Commerce’s 2019 Energy and Infrastructure Conference in Roanoke on April 17-18 there was agreement that Virginia needs for every corner of the commonwealth to have good broadband service. Since this SUP is being reconsidered, and since on March 19, 2019 Governor Northam signed legislation (HB 2691; Code of Virginia section 56-585.1:8) that will allow Dominion to help make broadband available in underserved areas, the county should revisit this issue as part of reapproving the SUP. Because the original SUP was issued for only 18 months, there is an opportunity to respond to new conditions – the change in state law concerning utility sale of broadband – since the pipeline has not yet been built. Citizens are asking that the Supervisors again approve the SUP for the usual 18 month term. Many things related to technology, cybersecurity and other issues are changing quickly, so the door should not be closed to asking ACP to include new technology or address new issues by making the SUP last more than 18 months. This entry was posted in Certificates of Approval, Compressor Stations, Dominion, Events on April 18, 2019 by Ellen Bouton. 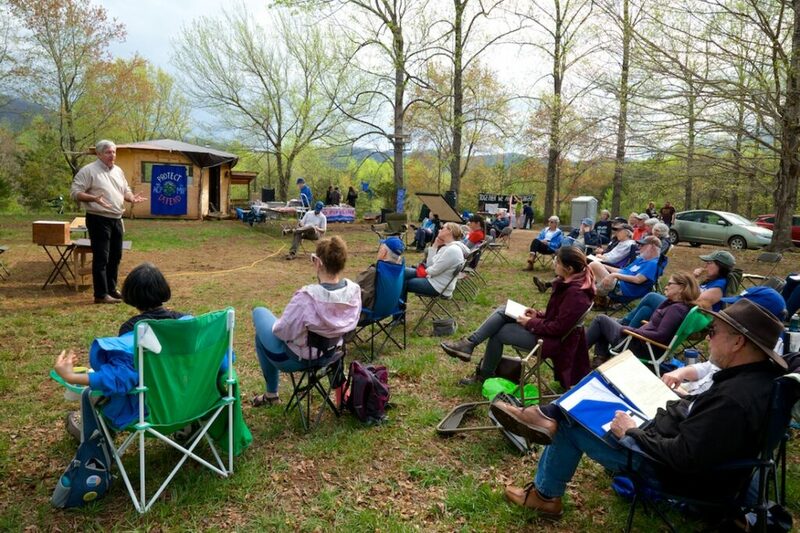 On Saturday April 13, 2019, Friends of Nelson held a day long workshop at Spruce Creek Camp featuring six speakers, a tour of the proposed route across the Blue Ridge Mountains, and hands-on exercises on safe participation in a protest action. The event ended with songs and dancing. Richard Averitt, a local Nelson County landowner, who forcefully outlined what he and his family have had to go through in dealing with eminent domain and “quick take” attempts to seize their property. The present legal framework and particularly the Sage v. East Tennessee case, are structured to deny him and all resisting landowners ‘due process’, a fundamental right enshrined in the US Constitution. William Limpert, a landowner from Bath County, spoke about his research into coatings applied to gas pipelines to prevent corrosion. His preliminary findings indicate that long term storage of pipes in the sun breaks down the coating, which could lead to pipe corrosion and eventual catastrophic pipeline failure. He also voiced concern about the toxic properties of the coatings themselves. If the coating flakes off due to long term outdoor storage, these ‘flakes’ could end up in the water supply, especially when the pipe is laid in ground with porous Karst deposits. Karst is found along the proposed pipeline route in Highland, Bath and Augusta counties. Twenty thousand pipes on top of storage stacks have been exposed to sun for four years now, far exceeding the manufacturer’s recommended two year limit. Lakshmi Fjord, an anthropologist from Buckingham County, described Dominion Transmission’s persistent use of misleading demographic information to the Buckingham Board of Supervisors and in their Environmental Impact Statement, allowing the location of the highly dangerous and air-polluting compressor station right in the midst of a historically significant African American Community at Union Hill. Dr. Fjord and her team spent countless hours doing their own research to prove that the siting of the station was based on faulty assumptions that resulted in unnecessary harmful impacts. The scholarly research has been ignored by Dominion, the VA Department of the Environmental Quality, and the VA Air Pollution Control Board, and is now the basis for a suit brought by the Southern Environmental Law Center (SELC). Rick Cornelius, an experienced environmental lawyer, updated the group on the numerous legal challenges to the Atlantic Coast Pipeline. While some of these cases have been unsuccessful, several rulings have stopped the ACP project in its tracks, and other ongoing cases hold the promise for further delay. Mr. Cornelius appeared more optimistic about the ultimate outcome than he did in his previous presentation to the Friends of Nelson group last September. Jennifer Lewis, a founder of Friends of Augusta, described the how Karst deposits in Augusta County create frequent sinkholes. Currently there are three such holes in her neighborhood and it is not uncommon for sinkholes to swallow grazing cattle, tractors and other farm equipment. These ground disturbances could potentially rupture a gas pipeline, creating an explosion and/or pollute nearby or distant groundwater. Ms. Lewis then advocated for citizen involvement as a way to stop this ill-conceived project, urging the audience to join local boards and commissions. She also suggested that each person speak to five friends, associates, and/or family members about why they oppose the ACP. Tom Hadwin, a retired gas executive and an outspoken authority on energy and gas pipelines, made a strong presentation on why the energy needs of Virginia and North Carolina are better met by utilizing existing pipelines rather than building new ones, by practicing energy conservation, and by building alternative energy sources. He pointed out the demand for electric power and natural gas is actually flat or slowly increasing contrary to Dominion’s misleading growth projections outlined in their EIS submission. He described the economic incentives utilities have in building new pipelines, power plants, and even solar farms, and why their concern is for increasing profits for their stockholders and investors rather than for their ratepayer customers. He emphasized that the subsidiary entity that builds and transports the gas does not own or the sell the gas. Similarly, Amazon, which now has a subsidiary that transports the Amazon packages by airplane, competes with traditional shippers such as FedEx and UPS. It costs more to ship gas in new pipelines than existing ones, but the ratepayers have to pay the higher price because of the contracts signed by these entities. Although the original arguments for building the ACP were the supposed need for additional gas, that the gas would be cheaper, and that the project would create thousands of jobs, none of these three things are true today. The previous expansion of existing pipelines already in the ground exceeds the capacity of the proposed ACP and MVP pipelines combined. New pipelines cost more to ship gas than existing ones, and jobs aren’t created because an existing labor force of skilled pipeline workers travels from state to state, working on one construction project for eight months, then going on to another. The workshop ended with a call to action and a handout with detailed steps for ways informed citizens could express their opposition and fight against the ACP. Of particular concern is stopping Congress from passing a law which circumvents the courts and allows the present proposed route to cross the Appalachian Trail and Blue Ridge Parkway in Nelson County. 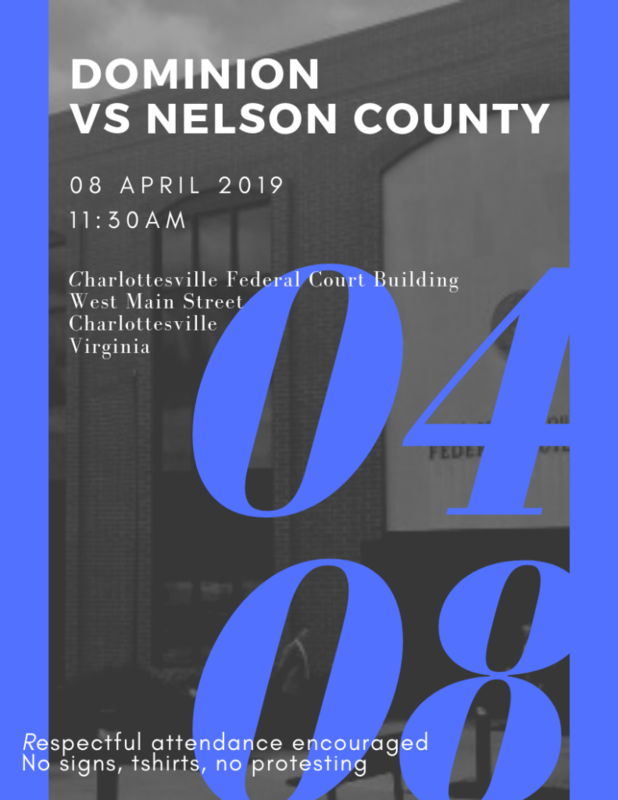 This entry was posted in Citizen Activism, Events, Friends of Nelson, Videos on April 17, 2019 by Ellen Bouton. 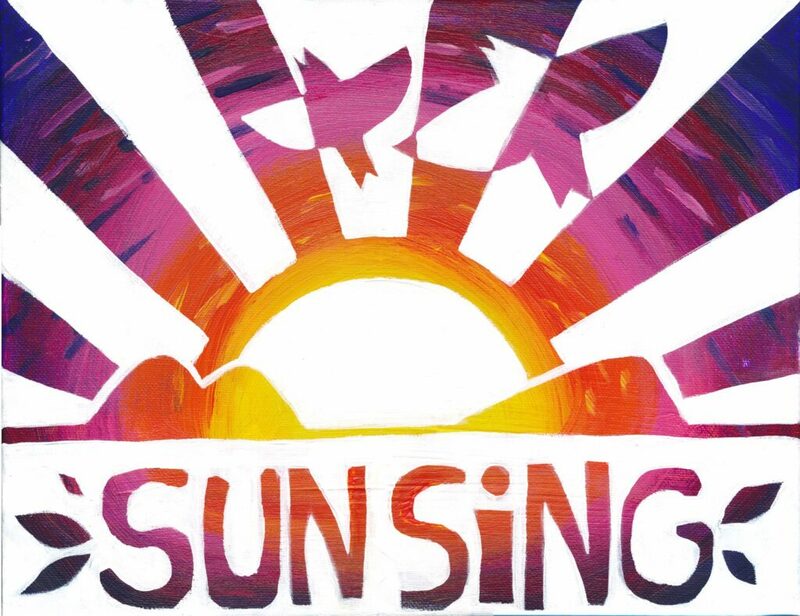 Meet the SUN SiNG Collective, working now to create a new no pipeline anthem and song video and a theatrical concert evening to lift up our resistance and future lovin’ souls. April 26, 6-9 pm. The Jefferson Theater, Charlottesville. All proceeds go to Interfaith Alliance for Climate Justice. This entry was posted in Events, Songs and Stories on April 11, 2019 by Ellen Bouton. Singing Yes! to the Solar Revolution is saying no to new fossil fuel infrastructure. Join Water is life. Protect it. and ARTivism Virginia for an evening of beauty and hope and for the premiere of “To the River”, a new anthem and song video to stop the Mountain Valley and Atlantic Coast fracked gas pipelines. Sing out Yes! to a sustainable future for our children, our environment and our democracy. The Sun Sing Collective is a group ARTivists gathering now to collaborate on original music, video, art and puppetry to tell the story of the MVP & ACP and to stop their destruction. This entry was posted in Events, Songs and Stories, Videos on April 1, 2019 by Ellen Bouton.